Throughout its 50 years, the Rotary Club of Pine Rivers has been a strong supporter of the Rotary Youth Exchange programme. This has given members and students a great deal of enjoyment. The club has also maintained a strong focus on fellowship and a desire to enjoy all of the project work we do. This has led to our reputation as a friendly club to visit. Since well before 1980 we have operated a series of food vans. This has been a source of both enjoyment and tribulation for members, but it has also given us a public face. People at functions keep returning to buy our chips and pluto pups. The Rotary Club of Pine Rivers turned 21 in 1980. A dinner was attended by the president of our parent club, Nundah. Our club sponsored the Rotary Club of Strathpine, which was chartered on 27 September 1980. Also in that year Handihome, a home for handicapped people, was started. Some members undertook a FAIM trip to Kar Kar Island, PNG. 1981 saw the Hawkins Hassall Hall completed at the Lawnton Showgrounds. This building is a memorial to past members. We chartered the Pine Rivers Rotaract Club that year. After many years of safe cycling training at various venues, we commenced work on a permanent track near the PCYC grounds at Bray Park in 1982. Work on the Safe Cycling track continued for a number of years and was completed in 1986. 1983 saw projects to support the Marsden Home for Boys. An Interact club at Dakabin State High School was started in 1984. A larger food van was purchased from another service club in 1985, and the main output from this van changed from pluto pups to chips. Handihome opened in 1986, after some years of good work by members and community support. Support for polio plus commenced after a request from Rotary International. PDG Allan Male had a dream of a youth centre in a rural setting, and the Shaftesbury campus was started at Burpengary. 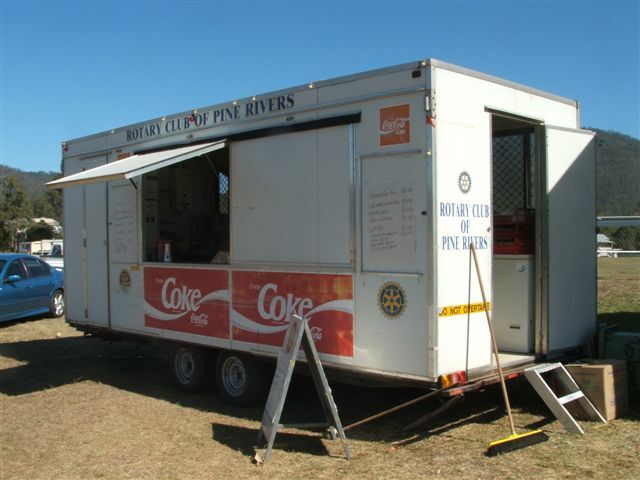 Our club built a brick barbecue at the site, and our food van was used frequently. Around 1988 we joined with the Geebung club to develop catering for an annual vintage car swap meet. This proved to be a successful event for some years. We also commenced work to build an aviary at Shaftesbury Campus, so that residents could learn to care for birds. Another rewarding project we adopted was the Sevana Sarana Foster Parents Scheme, supported through the Rotary Club of Colombo East, Sri Lanka. This project was maintained for over 10 years as the two children grew through their schooling and then commenced their careers. The club had sponsored the initial start of Pine Rivers Meals on Wheels and, in 1991, we were proud to present 15 year volunteer awards to some of their helpers. We also donated funds through an urgent Matching Grant to combat a typhoid epidemic in PNG. During the Second World War, two Spitfire aircraft collided in flight near Young’s Crossing. Some items from these aircraft were still in existence and we erected a memorial to the accident on land close to where one of the aircraft came down. Since 1996 the memorial has been the site of an annual remembrance service. This has been attended by original Squadron members and has seen flypasts by Spitfire aircraft. The squadrons presented the club with a plaque in 2002, recognising our support for their gatherings. During 1996 we presented 20 year awards to Meals on Wheels volunteers. Similar recognition has been made in more recent years. During 1998 we were approached by some local residents who had the desire to commence a Probus club. We were delighted to sponsor the Kallangur Probus Club, which is strong and has a growing number of members. In 2002 we commenced an annual Police Officer of the Year award. We seek community nominations to recognise the difficult but excellent work the members of our Police Service perform. This is an annual event, and has been strongly acknowledged by the Police members. A Traffic Branch officer won the award in 2004, and he was very grateful to learn that the community has praise for his (often) unpleasant duties. Our club also sponsors an annual community service award presented to outstanding volunteers during the annual Pine Rivers Shire Combined Service Clubs meeting. All clubs are encouraged to make nominations, and the host club makes the final selections, then we provide the awards. We have found that Rotary Youth Exchange is one of the most rewarding projects. We have hosted a student almost every year, and we sponsor outbound students whenever we can. The rewards that flow from hosting a youth from another country are enormous, and each year we look forward to the opportunity.